at First United Methodist Church, St. Johns, MI. Primary comparative texts about Food & Fellowship (including "one who serves"), at (Rutgers University Dept of Religion) Mahlon H. Smith's Into His Own: Perspective on the World of Jesus companion to the historical study of Christian texts. "Receiving the Sender," "Leader as Servant," The Jesus Database, an online annotated inventory of the traditions concerning the life and teachings of Jesus. Dr. Gregory C. Jenks, FaithFutures Foundation. XXIV.48-50; XXV.2-3, 9, 11; Tatian's Diatessaron (c. 150-160). "Those who are most humble and self-denying, most resemble Christ, and shall be most tenderly owned by him." "One such little child - Either in years or in heart." "Whosoever shall receive one of such children--so manifesting the spirit unconsciously displayed by this child." "The two conditions of true greatness are humility and service; not to be the servant of friends, or kindred, or of a class, or even of church members, but of all, like Christ." Commentary, Mark 9:30-37, Elisabeth Johnson, Preaching This Week, WorkingPreacher.org, 2018. "Jesus keeps trying to escape notice." "A Different Kind of Greatness," David Lose, ...in the meantime, 2018. "I don’t think that the question of greatness has gone away since Jesus’ day." "The Greatest," Karoline Lewis, Dear Working Preacher, 2018. "Greatness is determined by weakness and vulnerability." "Who Is the Greatest?" Janet H. Hunt, Dancing with the Word, 2018. "How might living in the way Jesus calls us to today just change the world? How have you seen this to be so?" "Receiving the Kingdom as a Little Child," Fritz Wendt, Political Theology, 2018. "When we stop clinging to what we know and what we are, we can go out into the world without fear, insecurity, resentment, and judgment, as true Children of God." Commentary, Mark 9:30-37, Micah D. Kiel, Preaching This Week, WorkingPreacher.org, 2015. Faith & Fear, David Lose, ...in the Meantime, 2015. "I think this week’s reading is a fascinating study of the relationship between fear and faith." "The Nature of Faith," Karoline Lewis, Dear Working Preacher, 2015. Syrian Refugee Crisis - Our Chance to See God, Cari Jackson, ON Scripture, 2015. Discussion Questions. Video: European Refugee Crisis. Sermon Notes, Porter Taylor, The Liturgical Theologian, 2015. Journey with Jesus Dan Clendenin, 2015. "Child Like," Nancy Rockwell, The Bite in the Apple, 2015. Political Theology Today Alastair Roberts,2015. Art and Faith Matters Lynn Miller, celebrating our creative and living God by generating art and architecture resources for congregations and individuals. Art and Faith Matters facebook page contains additional resources. Stewardship of Life Sharron R. Blezard, Stewardship of Life, 2015. "Servanthood is where our humanity flourishes," "What is greatness?" Andrew Prior, One Man's Web, 2015. Dancing with the Word, Janet H. Hunt,2015. "The Sign of the Cross," Suzanne Guthrie, At the Edge of the Enclosure, 2015. Ponderings on a Faith Journey Bob Cornwall, Ponderings on a Faith Journey, 2015. Care for Creation Commentary, Tom Mundahl, Lutherans Restoring Creation, 2015. Law and Gospel Everywhere Glenn Monson, 2015. Lectionary Poetry, Scott Barton, 2015. "The Way of the Wicked," Alan Brehm, The Waking Dreamer, 2015. "We must beware when we disregard the welfare of the least and the last and the lowest, because as the Psalmist warns us, that is the way of the wicked, and it is a way that will perish." Commentary, Mark 9:30-37, Amy Oden, Preaching This Week, WorkingPreacher.org, 2012. "In our own time, no one wants to look uninformed, confused, or clueless. We withhold our toughest questions, often within our own churches and within Christian fellowship. We pretend we don't have hard questions." "Jesus' Death and the Future of Violence," Matthew L. Skinner, ON Scripture, 2012. "Be wary of anyone who comes up with too neat and tidy a theory about exactly how Jesus’ death and resurrection changes the cosmos and God’s disposition toward the world. For good reason the New Testament writings include a spectrum of metaphors, language, and claims to convey the significance of the cross." "The Value of a Good Question," David Lose, Working Preacher, 2012. "So this week, Working Preacher, I'm going to keep my suggestion equally simple: invite people to write down a question about the faith, God, or the Bible that they wonder about and pass them in with the offering." "Edgy Conversations of a Vulnerable Christ','" D Mark Davis, raw translation and exegesis/questions, Left Behind and Loving It, 2012. "I am not sure whether the related verbs διαλογζομαι and διαλγομαι ought to be translated as implying discussions or arguments. They seem related to the English term 'dialogue,' but perhaps the context determines whether they are conversational inquiries or heated arguments." Lectionary Greek, Mark 9:30-37, 2012. The First Will Be Last and the Last Will Be First, audio telling, story in episodes, graphic, audio and written commentaries. Go Tell Communications, Biblical Storytelling for the Global Village, 2012. "The kingdom of God is not so much a place we go when we die, although it is that as well. The kingdom of God is a way of life, something here and now." "The Politics of Mark 9:30-37: Welcoming the Child," Amy Allen, Political Theology, 2012. "Children occupied an interesting place in the first century household (for Jews and Romans alike). They represented the future—they would carry on the family name, provide for their aging parents, and produce the next generation. But in the present, they were a liability." Holy Textures, Understanding the Bible in its own time and in ours, Mark 9:30-37, David Ewart, 2012. "...once again Jesus is challenging us to reverse long-standing, ingrained, human habits. To set aside our common human understanding of how to win fame and glory, and instead learn from Jesus God's deep hospitality and honouring." Children in the Center of the Assembly, Clint Schnekloth, The Hardest Question, 2012. "Are we truly welcoming or faux welcoming." "A View from the Other Side of the Pulpit: The Price of Welcoming," Janet Hunt, Dancing with the Word, 2012. "Have you ever experienced the consequences of welcoming others in a not so positive way?" "The Great Subversion," Andrew Prior, 2012. Comentario del Evangelio por Darío Barolin, Marcos 9:30-37, Working Preacher, 2012. Commentary, Mark 9:30-37, Alyce M. McKenzie, Preaching This Week, WorkingPreacher.org, 2009. "It turns out that to be great is to be focused on something quite other than oneself. It turns out that greatness lies in welcoming one who is not viewed as great by the culture, the child, the one who is beyond the circle, who needs a welcome." "Jesus Makes His Second Passion Prediction," Michael A. Turton's Historical Commentary on the Gospel of Mark, "a complete verse-by-verse commentary on the Gospel of Mark, focusing on the historicity of people, places, events, and sayings in the world of the Gospel of Mark." "First Thoughts on Year B Gospel Passages in the Lectionary," Pentecost 16, William Loader, Murdoch University, Uniting Church in Australia. "Jesus is challenging both stances: people wanting to use power to establish their own value and people using power as the measure of value of human beings. Jesus subverts both." Commentary, Mark 9:33-37, Imani Jones, The African American Lectionary, 2009. "As we reach out and draw children from the margins of society to the center, we welcome them as Jesus has graciously welcomed us..."
Join the Feast, Mark 9:30-37, Grant Holbrook, Union PSCE, 2009. "If we set aside proof texts and vitriol (if only temporarily), how does Jesus actually converse with others, and how does he treat the disciples in terms of encouragement and correction? The end of Mark 9 provides at least two jumping off points, rooted in the conveyance of unanticipated hospitality and a direct reliance on prayer, on God." Exegetical Thoughts by Brian Stoffregen at CrossMarks Christian Resources. "Who are the "unimportant" in the world today? How does the church relate to them? How should the church relate to them? What might this verse say about the way we do worship?" "Little Children and God's Kingdom: The Holy Grail of Human Greatness," The Journey with Jesus: Notes to Myself, Daniel B. Clendenin, Journey with Jesus Foundation. "What would our lives look like if we really believed and acted on these words of Jesus?" "Jesus Loves All the Little Children of the World," Gospel Analysis, Sermons from Seattle, Pastor Edward F. Markquart, Grace Lutheran Church, Seattle, Washington. Detailed background and exegesis. "Servant of All," Rev. Bryan Findlayson, Lectionary Bible Studies and Sermons, Pumpkin Cottage Ministry Resources. Includes detailed textual notes. "Cross-Journey," Michael Hoy, Sabbatheology, The Crossings Community. "And that last and lost place is precisely where our Lord meets us, on our home turf, to change the direction for our good." "Who Is the Greatest? ", The Way of the Cross: Markan Texts for Late Pentecost, Donald H. Juel, Texts in Context, Word & World, Luther Northwestern Theological School, 1994. "The Powerful Weakness," Ordinary 25B, Fr. Gerry Pierse, C.Ss.R., from Sundays Into Silence: Reflections on the Sunday Gospels in the Light of Christian Meditation. Claretian Publications. "Much of our traditional prayer is a sort of tour de force, on God - either trying to push him to do our will or to get him on our side to accomplish what we desire. To meditate, on the other hand, is to be weak and powerless, in the secure confidence of God's care and love for us." "To Serve a Child," Larry Broding's Word-Sunday.Com: A Catholic Resource for This Sunday's Gospel. Adult Study, Children's Story, Family Activity, Support Materials. "When was the last time you cared for a child? What happened?" Wellspring of the Gospel, Ordinary 25B, Catherine McElhinney and Kathryn Turner, Weekly Wellsprings. "Caring for Children in Crisis," study guide for adults, Robert B. Kruschwitz, (other resources at) "Children," Christian Reflection, The Center for Christian Ethics at Baylor University, 2003. "Teaching Children the Story of Creation," study guide, Robert B. Kruschwitz, (other resources at) "Moral Landscape of Creation," Christian Reflection, The Center for Christian Ethics at Baylor University, 2001. "Mark 9: Teaching in Capernaum," wikipedia. Achtemeier, Paul J., "An Exposition of Mark 9:30-37," Interpretation, 1976. Crossan, John Dominic, "Kingdom and Children: A Study in the Aphoristic Tradition," Semeia, 1983. Fleddermann, Harry, "The Discipleship Discourse (Mark 9:33-50)," The Catholic Biblical Quarterly, 1981. Gundry-Volf, Judith M., "Mark 9:33-37," Interpretation, 1999. Gundry-Volf, Judith, "'To Such as These Belongs the Reign of God': Jesus and Children," Theology Today, 2000. Hinkle, Mary E., "Seeing Things," The Christian Century, 2003. Joy, David, "Markan Subalterns/the Crowd and their Strategies of Resistance: A Postcolonial Critique," Black Theology, 2005. Marcus, Joel, "Counting Diamonds," The Christian Century, 2000. 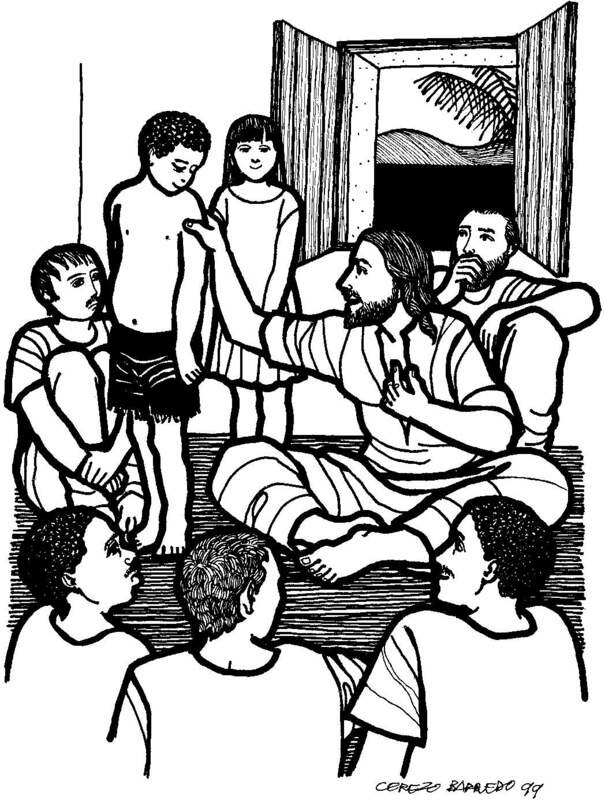 Myers, Ched, "As a Child: Jesus' Solidarity with the Least of the Least," The Living Pulpit, 2003. Perry, John M., "The Three Days in the Synoptic Passion Predictions," The Catholic Biblical Quarterly, 1986. Proctor, Mark, "'After Three Days': Mark 8:31; 9:31; 10:34: Subordinating Jesus' Resurrection in the Second Gospel," Perspectives in Religious Studies, 2003. Reedy, Charles J., "Mark 8:31 - 11:10 and the Gospel Ending," The Catholic Biblical Quarterly, 1972. Robbins, Vernon K., "Pronouncement Stories and Jesus' Blessing of the Children: A Rhetorical Approach," Semeia, 1983. Santos, Narry F., "Jesus' Paradoxical Teaching in Mark 8:35; 9:35; and 10:43-44," Bibliotheca Sacra, 2000. Strecker, Georg, "The Passion- and Resurrection Predictions in Mark's Gospel," Interpretation, 1968. Willimon, William H., "Receiving Little Jesus," The Christian Century, 1985. "A Hopeful Fanatic," The Rev. Barbara Lundblad, Day 1, 2012. "Receiving Such a One as This," Emmanuel Katongole, Faith and Leadership, 2012. "Insignificant Greatness," the Rev. Stephen Lewis, Day 1, 2009. Pentecost 16, 24 September 2006, Jim Mueller, Göttinger Predigten im Internet: Every Sunday Sermons based on the RCL by a team of Lutheran theologians/ pastors. "Shanghaied," The Rev. Dr. David Galloway, Day 1, 2006. "Jesus Loves All the Little Children of the World," "A Servant's Heart - Trialogue Sermon," Sermons from Seattle, Pastor Edward F. Markquart, Grace Lutheran Church, Seattle, Washington. "Medicine for Dry Bones," the Rev. Grace Imathiu, Day 1, 2000. "Who Is the Greatest?" Illustrating the Story (lessons, children's sermons), coloring pages, activity sheets, crafts, children's songs. MSSS Crafts. "Who Is the Greatest?" Charles Kirkpatrick, Sermons4kids.com. "Upside Down," Jim Kerlin, childrensermons.com. Mark 9 & 10 Crossword, Don Crownover's Bible Puzzles. Mark 9:35, memory verse activity, MSSS Crafts and Resources for Bible Stories. "As Small as Mingo," from A Certain Jesus by Jose Ignacio and Maria Lopez Vigil. Ideal for catechetical and liturgical dramatization of today's gospel. Claretian Publications. Clip Art Images: Mark 9:30-37, Misioneros Del Sagrado Corazón en el Perú. Mark 9:30-37, at Cerezo Barredo's weekly gospel illustration. Liberation emphasis. Commercial Site: "The Last Will Be First," (Mark 9) Visual Liturgy/Film, The Work of the People. “Do Not Turn Away the Children” is Carolyn Winfrey Gillette’s hymn about Jesus welcoming the children and the Church’s call to respond to children’s challenges today. Tune: BEACH SPRING 8.7.8.7 D (“God Whose Giving Knows No Ending”). “Children Are Welcome, Christ Said One Day” (also know as “Welcoming God”) is Carolyn Winfrey Gillette’s hymn about Jesus welcoming the children, women, outcasts and the Church following his example now. Tune: ASSURANCE (“Blessed Assurance, Jesus Is Mine!”).